Yesterday, I had the privilege of a speaking to a crowd of history-minded Jefferson Citians as we welcomed C-SPAN to our community. The cable channel will be in town this week documenting our community’s history – including Lewis & Clark, the State Capitol, State Archives, Lincoln University, and the old MSP. Following brief introductory remarks, Dr. Gary Kremer and historian Mark Schreiber spoke about Jefferson City history. Dr. Kremer focused on our town’s founding – and the incredible and inspiring story behind the founding of Lincoln University – while Schreiber gave a brief history of MSP. [T]he present political chaos is connected with the decay of language, and that one can probably bring about some improvement by starting at the verbal end. If you simplify your English, you are freed from the worst follies of orthodoxy. You cannot speak any of the necessary dialects, and when you make a stupid remark its stupidity will be obvious, even to yourself. In the end, the advice is simple. To convey ideas effectively, leave the $10 words for the stiff-suits at the American Heritage Dictionary of the English Language. Instead follow the lead of Mark Twain, Abraham Lincoln, and the Elements of Style. * Use simple, but active words. Keep your sentences short. Be direct. *Flesch-Kincaid ‘reveals’ The Adventures of Huckleberry Finn was written for sixth-graders, and the Gettysburg Address for ninth-graders. Better sentencing and parole guidelines providing for quick and certain punishment of people who violate the terms of their probation and parole. HB1525 will likely lead to lower rates of recidivism by allowing for nearly immediate jail when offenders violate terms of their probation and parole. It was passed unanimously in the House (151-0) and by a vote of 24-3 in the Senate. Improved ignition interlock requirements in SB480 will require the use of ignition interlocks for certain DWI offenders – and, in some limited cases, allow for driving privileges if the person puts an interlock in their car. This provision was supported by Mothers Against Drunk Driving. Similar provisions adopted in other states have led to a 52 percent decline in drunk driving deaths. Cell phones were added to the no-call list in HB1549. Fourth of July celebrations will continue thanks to SB835. Missouri’s worst-in-the-nation racially discriminatory crack sentencing disparity will soon be history thanks to SB636. Charter schools will be placed under greater accountability measures and be allowed to expand to more areas of the state with struggling schools as a result of SB576. Students in two districts facing severe travel hardships will be allowed to attend the public school that makes more sense for them in their families thanks to HB1789. There are other as well, but these ten stood out on first review. Rep. Stephen Webber (D-Columbia) is one of my favorite colleagues, Democrat or Republican. He knows how to disagree without being disagreeable and is always an effective advocate for his constituents. I agreed with him on the KU license plates – and with everything he says in this speech, but I could not resist posting this video – which is made all the better by the fact that Rep. Webber is strikingly similar to Napolean Dynamite in a more-polished cosmopolitan way. The House just passed legislation saving Fourth of July celebrations around the state. 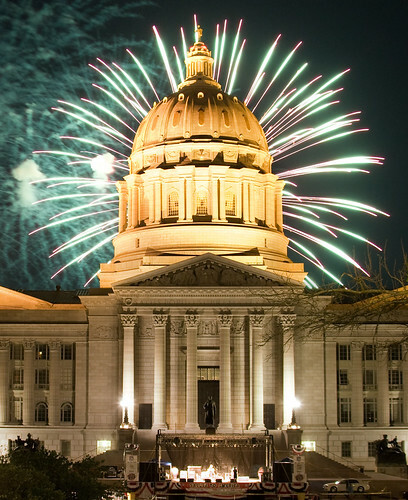 Senate Bill 835, sponsored by Senator Mike Kehoe and carried in the House by Cole County’s own Mike Bernskoetter, makes Missouri law compliant with new federal regulations – and allows us to continue to have large fireworks at Fourth of July celebrations. The legislature TAFP’d a bill to add cell phones to the no-call list earlier this week. No more unwanted solicitations on your cell phone. I was glad to be able to support this legislation. As if to prove my point from today’s earlier post, we’re working late in the Missouri House tonight. We’re now on SB636 – what started as a relatively simple bill, but now has dozens of amendments already on it – AND, has 49 amendments that have been offered to it tonight. Here’s an apt metaphor for the last week of session. All those little pebbles are ideas folks are trying to make into state law and each legislator must decide whether each individual pebble is good to keep or should be discarded – and there’s a whole lot of pebbles. They’ll akk be dumped on the concrete slab this week. In case anyone’s wondering what I’ll be doing once session’s out, now you know. I’ll be working on the chain gang with these two. And just for good measure, since we’re talking about chain gangs, there’s not much better than the combination of Cool Hand Luke and Johnny Cash. Our neighbors rented a stump-grinder this weekend. I couldn’t resist the opportunity to take the greatest campaign pics ever. And like any true politician, I showed up well after they had started working, stole the photo-op, then left well before the work was finished. Then, as if right on cue, all hail broke loose about 15 minutes after I left. Kinda like about 75 percent Quality Jobs Act press conferences.